Air Conditioning Theft: Could You Be a Victim? People often invest a great deal of time and money into ensuring that their homes and businesses do not face a break-in. However, they occasionally forget that some of their valuable pieces of equipment, including air conditioning condensers, are easy targets for thieves because they are located outside. Criminals want to steal the valuable copper components inside the condenser and other machines. Copper theft is a burgeoning business in the United States, to the tune of $1 billion per year. When thieves take your copper, you must pay a lot to repair or replace damaged equipment. These tips tell you how you can protect yourself and your investment. Theft is a primary concern with any piece of equipment you have sitting unattended on your property. Condensers need a lot of clearance for airflow, so they must be fairly exposed. Couple this vulnerability with a position on the property that is easy to see from the street, and you have a dangerous combination. Thieves may steal on your property very quietly and, within minutes, remove the copper from your condenser coils. Criminals may only earn a few dollars for the copper they steal from you. But, you face hundreds of dollars in repair costs for the damage they cause. There are a few actions you can take to make your outdoor HVAC equipment a less-attractive target for thieves. 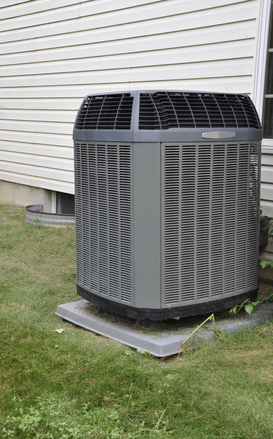 First, if your condenser is identified plainly from the street, you may consider relocating it to a more-secluded area. Of course, this will require specialized service from an HVAC contractor such as A. Borrelli Mechanical. Other practical choices improved the security of your property. You can purchase cages for your condenser and heat pump that do not restrict airflow, but make it harder for thieves to get at the equipment. And, you can benefit by adding or improving video surveillance for your property. If criminals know they are watched, they are less likely to take the risk. The professionals at A. Borrelli HVAC are well-equipped to advise you about your risk of losing your HVAC equipment to copper thieves. You may only need to take a few simple steps to dramatically improve the security of your property and the valuable machines you maintain. With a little added protection, you can sleep safely at night, knowing that the air conditioning will turn on in the morning when you need it.